It’s been a few weeks since the last installment of Mobile Mac, so rather than focus on a single bag or upgrade, I’m going to give you the rundown on a few mobile accessories I’ve been testing recently. 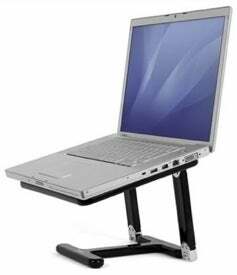 Over the past year, we’ve covered a number of laptop stands here on Mobile Mac; for example, Griffin's Elevator, APC's Ergonomic Notebook Stand, Rain Design's mStand, and Neo-Flex's Lift Stand. These products let you work more ergonomically at a desk by elevating your laptop screen to a proper height while you use an external keyboard and mouse. But what if you’ve got two desks—for example, at work and at home—and you want to use a stand in both places? You could buy a stand for each location, but another option is Matias’ portable iFold ($60). The stand’s three black-and-metal pieces are connected by two sets of cleverly-designed hinges. Flip the contraption open and you’ve got a stand that elevates the back of your laptop approximately eight inches off your desk—higher than most of the other stands I’ve tested—with plenty of room underneath to stow your external keyboard when not in use; rubber pads keep the stand and your notebook in place. 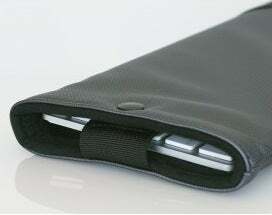 Flip the iFold closed and it collapses down to just 11.4 by 8.9 by 0.7 inches, small enough to fit in most laptop bags. The iFold isn’t as solid as some other stands; your notebook will bounce quite a bit if you try to type on it while it’s on the stand. But that’s to be expected, given that the iFold’s portable design doesn’t allow it to be as sturdy as some stationary models. 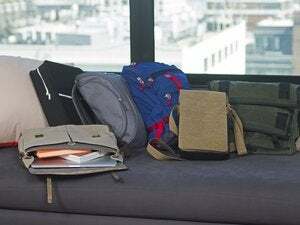 The bigger issue is the iFold’s heft; it weighs just under two pounds, which is a lot to add to your likely-already-too-heavy laptop bag. Still, the iFold’s design makes it handy for tossing in a suitcase for a trip, and it even provides benefits for non-portable use: when you want to use your desk for other things, you can collapse the stand and stick it in a drawer or on a bookshelf. None of the other stands I’ve tested store as conveniently. Speaking of using an external keyboard, I’ve been testing Apple’s current Bluetooth wireless keyboard, and despite complaints about its lack of a numeric keypad—or perhaps because of that omission—it makes for a great laptop companion. Thanks to its astonishingly slim profile and diminutive dimensions, the keyboard easily slips into even the smallest laptop bag. Combine the Apple Wireless Keyboard with your notebook, a portable stand such as the iFold, and a good portable mouse such as the Logitech VX Nano and you've got a surprisingly compact, yet ergonomic, on-the-go workstation. Having tested many, many shoulder bags over the years, one thing I’ve found is that while vendors spend lots of design hours trying to perfect the bag itself, too many neglect the part of the bag you spend the most time using: the shoulder strap. With a few notable exceptions, these straps are at best thick fabric with some sort of cushioned pad for your shoulder, and at worst just a strap of bare, nylon weave. We covered one “premium” strap upgrade, Skooba Design’s Superbungee Strap ($26) in our recent Cool Mac Gear guide; another quality option is Tom Bihn’s Absolute Shoulder Strap ($25). 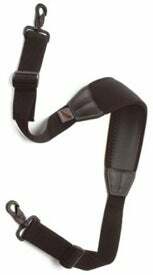 In addition to the requisite thick strap and heavy-duty, rotating, metal snaphooks, the Absolute Strap features a meaty, semi-elastic shoulder pad that’s neoprene on one side and grippy rubber on the other. The pad stretches just enough to act as a kind of shock absorber, making your load feel lighter, and the pad stays on your shoulder much better than most. The pad doesn’t slide along the strap, but the strap itself is adjustable on both ends to let you position the pad exactly where you want it. If you spend a lot of time carrying around a shoulder bag, either of these replacements will likely be a welcome upgrade in comfort over your bag’s stock strap.